When looking at a family tree most people start at the obvious sources – census records or births, marriages and deaths. There’s certainly a great deal to be gleaned from those, and for many people interested in the basics it will be ample. Someone compiling a complete family history wants to go beyond that, to fill out as much of the picture as possible for each ancestor. For that, the more records you can obtain, the better – and wills can prove to be some of the most useful as they offer a very powerful snapshot of the family at the time. If you can amass wills for several generations of the family, you have a full canvas. If there was property there would be a will. That didn’t necessarily mean bricks and mortar and land, although where it did involve those wills were a necessity. It could mean some small accumulation of wealth where the goods left by the deceased were to be divided amongst family members. A will made it all legal. The poor generally didn’t leave wills as there was little or nothing to pass on to their descendants. As a middle class arose, the use of wills became more widespread; it had originally just been something for the nobility, where the sharing out of wealth and bequests were important. Wills reveal a great deal about family relationships. The person writing the will gives the name of the person to whom an item is bequeathed and also the relationship between them (son, daughter, wife, nephew, etc.). Except in the rare instances where someone had been disinherited, this allows to check or fill out the family tree. There can often be surprises, often in older wills, where items or money are left to children born out of wedlock but acknowledged. For any family historian, information like this is pure gold, as there might be no other mentions of the business. What a person leaves will tell you how wealthy they were. That’s quite self-evident, but ideas of wealth have altered over the years. That needs to be remembered, and you need to be familiar with the different definitions of wealth for the period you’re investigating in order to judge properly. This is where a sound knowledge of history, especially social history, will stand you in good stead. Where there’s property, there’s money, and the more property, the greater the fortune. A quantity of silver plate and furniture means wealth, understandably, but look at other items, too, such as linens and books. These would only belong to families with some riches. There will often be an inventory of all the person’s possessions as part of the will (sent to the probate court by the administrator of the estate). This can include money, especially in times before banks became commonplace, where families and merchants would have a counting hose on the premises where they kept money and letters of credit. This gives you an instant picture of the status of the deceased, and by extension, the family members. There will usually be bequests to some servants, and having a general idea how many servants the household had can offer a gauge of wealth. Where death duties had to be paid, the family was well-off. 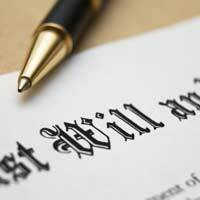 Tracing specific wills can take time. All wills have to be proven, that is, go through probate. Wills after 1858 can be obtained from the Probate Service, with some disputed wills held at the National Archives. The picture before 1858 becomes more complex, as there’s no single index of proven wills. Depending on where the deceased lived it will fall under the Archdiocese of York or Canterbury, and if the person left good worth more than £5 – a good some several centuries ago – the will would need to be proved at the Archbishop’s prerogative court. Otherwise it would be at a lower ecclesiastical court (until 1858 wills were always in the province of ecclesiastical courts). As a general rule the wills can now be found in the local records office, and details of local archives can be searched on the ARCHON database at the National Archives.